As they enter the final stages of the Graduate Program, Specsavers graduates apply the skills they have learnt by participating in the ‘Year Two Project’ initiative. These projects see graduates plan and execute an in-store initiative that leads to positive outcomes for the store in an area that aligns with the graduate’s own professional development interests. 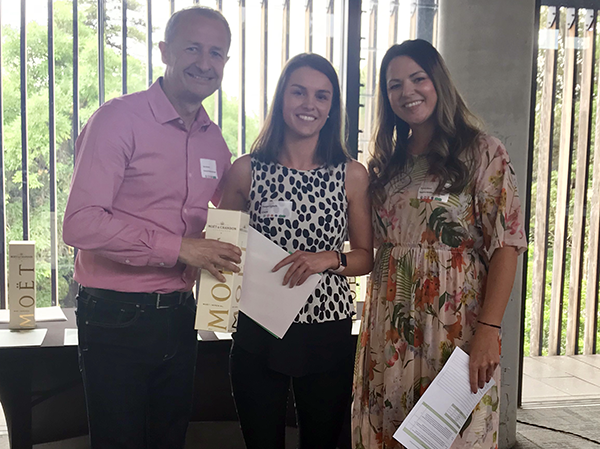 Specsavers Clare graduate optometrist Paige Lynch talks about the process and what she learned from implementing her Year Two Project, which was named the best of those presented in South Australia. For my project, I decided to conduct in-store team training on efficient and effective visual field testing. Visual field tests play an important role in patient care and accurate results are imperative for clinical efficiency. We as a store conduct lots of these tests, as we co-manage glaucoma with visiting ophthalmologists, and with the inclusion of OCT in our practice and the increasing clinical detail available through OCT scans, it was the perfect time to elevate the team’s knowledge in this area. Prior to beginning the Year Two Project, I was concerned that I would not be able to investigate a topic that could bring about meaningful results to benefit the store and our patients. However, once my mentor, Paul Carpenter, and I discussed the idea of conducting a staff training session to improve the reliability of visual field tests, I felt excited about the prospect of improving store and patient outcomes. In the 1.5-hour staff training session, I discussed the reasons why a visual field test might be unreliable, best practice for performing a visual field test, how to communicate with the patient, including strategies for improving the patient’s attitude towards the test, as well as why reliable test results are so critical for patient outcomes. In the subsequent weeks, I checked in with each staff member after they had completed a visual field test to ask if they had encountered any difficulties or challenges. If they had, we would discuss potential strategies and solutions. Paul and the entire store team were all very supportive and willing to participate and assist in achieving the objectives of the project. The Specsavers Professional Development team also provided ongoing support throughout the duration of the project to ensure it ran smoothly. In total, the project took place over four months, and a comparison of collated data from the visual fields tests taken during that period compared to the same period in the previous corresponding year showed a 60% reduction in the number of unreliable visual field tests that needed to be repeated. Results of a questionnaire that I issued to all staff before and after training also indicated a marked improvement in the store team’s knowledge and understanding of visual field tests by the end of the project. A reduction in the number of repeated unreliable tests means a reduction in the number of times a patient has to return to store to be tested. This is more convenient for the patient and therefore improves their store experience. It also improves patient visual outcomes by reducing the time it takes to get them the care they need. I learned from this project that initiatives as simple as a single team training session can have a significant impact on store efficiency and patient outcomes. Aspects of the project, such as holding the initial team meeting, helped me improve my leadership skills. It also helped me overcome my fear of public speaking; I found that this comes naturally when I’m speaking about a topic that I’m passionate about. Seeing the positive outcomes that have occurred as a direct result of my project – for both the store and the patients – has made me feel much more confident about my leadership abilities and future professional development.